Sorry I’ve been away for a bit, work and trips and writing for Python Magazine had me pretty busy and I wasn’t able to reply to everyone’s comments on the simple Python game engine. I really do appreciate the comments though so please keep them coming. I have been thinking about the simple game engine quite a bit though and wondering where to start on it all, and whether or not it makes sense to start on it at all! After some thinking I decided that what I would want most (for a variety of reasons) would be an easy to use level editor. So with a day off from work and life yesterday I started to do some hacking with PyGTK and pyglet to see if I couldn’t get a simple level editor going. 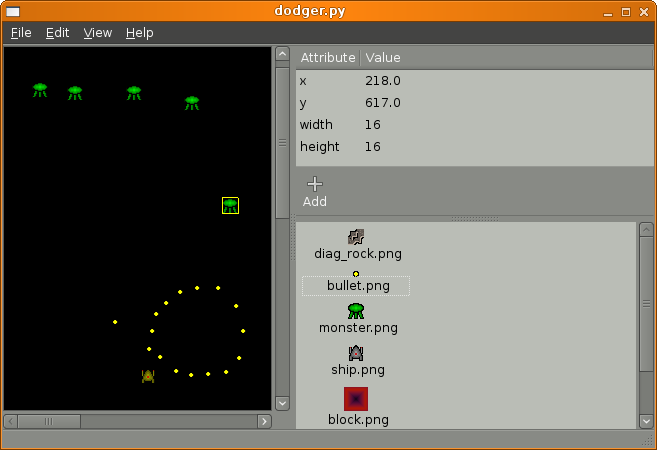 As you can see it’s a PyGTK application with an OpenGL window that displays pyglet sprites. There is a properties list, where you can add and edit properties or the sprite. There is also a “content” list that displays all of the graphics in your project’s “content” directory. Then you can add any of those images to your level. You can also select sprites and move them around, or edit their properties (notice the monster with the yellow border around it?). The idea is that eventually this will save the information out into a human readable file type (yaml, xml, whatever) that games (your game?) will then read in for their levels. 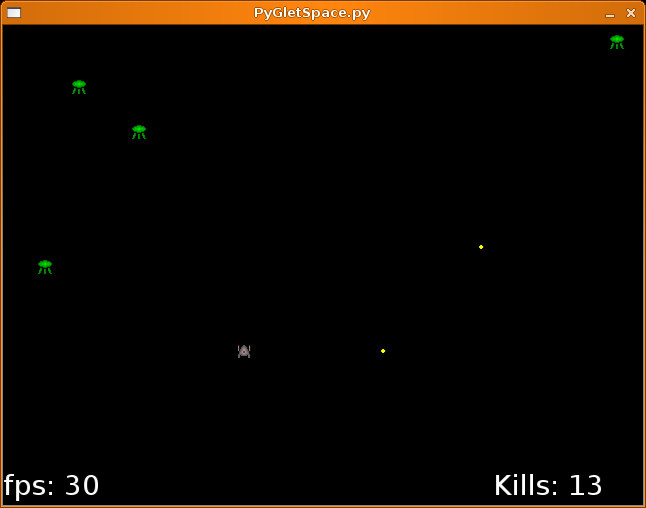 The properties will be saved with each sprite and then applied when you load the level. That way you can add specific properties to specific sprites. This is still very much a work in progress, but when it gets a little bit more stable and if people are interested I think I’ll create a project on sourceforge or google code so the other people can start working with it or hacking it.